All of the images that accompany this record were made by Richard Nicholson. Some of them form part of a series of portraits entitled The Projectionists. A professor in the Department of Film and Television Studies at the University of Warwick who’s currently working on a book about cinema-related environments and location sound recording, Lightborne is certainly qualified to tackle the topic of cinema projection boxes. 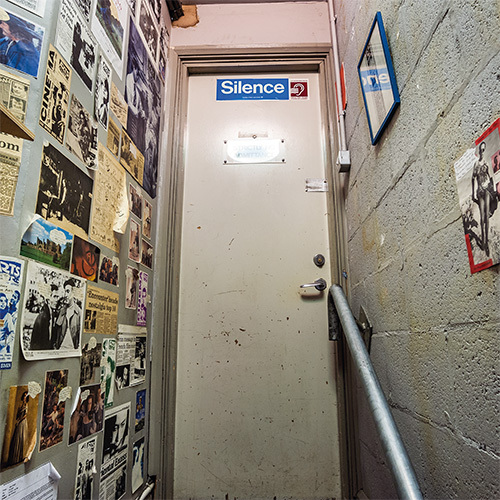 His release, which documents the transition from 35mm to digital within the projection booth, grew out of sound recordings he began making in early 2016. By the time his fieldwork started, the majority of UK cinemas had become digital only, which made Lightborne’s desire to capture the sounds of analogue projection booths an undertaking of considerable value. Of course, the setting is so carefully enclosed it ensures that most of the sounds occurring within it are unknown to the viewing audience, which makes it easy to forget that it’s the critical center of the cinematic experience. For that reason and others, Sounds of the Projection Box proves illuminating. Be aware that it is a field recordings-based work in the truest sense, with nothing added in post-production (e.g., musical elements) to make it more accessible. Side one documents the cinema-based assembly of a film from smaller reels through to projection before an audience and eventual disassembly, the reference to “The Thing” not to the equipment involved but to John Carpenter’s 1981 opus, the film used in this instance to illustrate the stages. In the opening piece, machine noises of various kinds appear along with the whirr of a film spooling, muffled snippets of conversation, and even fragments of music. 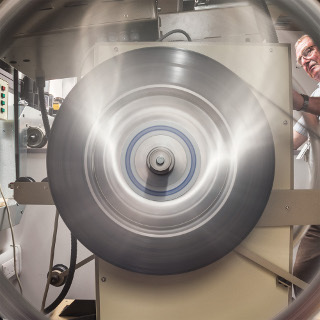 The splicing together of the smaller reels is heard during “Making Up the Thing,” where myriad tape noises and rustlings emerge alongside the rickety, techno-like pulse of a mechanical rewinder, after which the film, having been projected, is reduced to smaller reels that are then sent back to the distributor. On the second side, other cinema locations are represented, namely the Electric cinema in Birmingham, the Rio in Dalston, and the Hyde Park Picture House in Leeds. “Hyde Park Electromagnetic” is marked by the unusual electronic-styled sounds generated by conventional microphones plus contact and electromagnetic coil mics, whereas field, contact, and electromagnetic mics document the sound of a reel spinning furiously at the Electric. Traces of the 1940 Will Hay comedy Where’s That Fire? are audible in “The Electric,” which was recorded at the same cinema in the company of projectionist Sam Bishop. At album’s end, “Digital Light” shifts the focus from manually operated equipment to the digital projector, which, because its workings are largely concealed, doesn’t allow for the kind of tinkering projectionists bring to analogue equipment. Using an electromagnetic coil microphone, Lightborne was able to make audible the sonic life of the digital ‘black box,‘ resulting in, not surprisingly, the most electronic and synthetic-sounding track of the album’s ten. 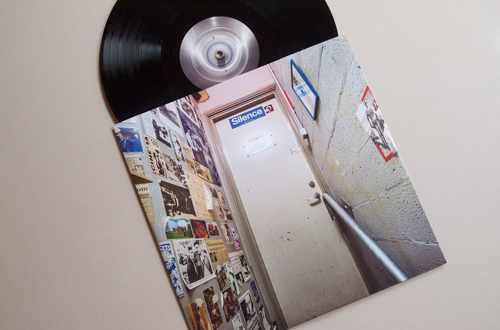 If ever a release could be used to argue for the full vinyl presentation, it’s Lightborne’s. 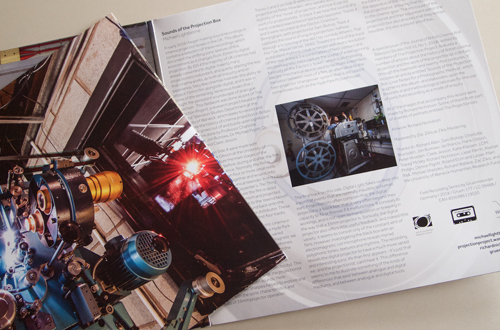 The beautiful photographic images on the foldout sleeve not only do much to enhance one’s impression of the project, they also convey the large size of the film reels and projection equipment involved in the projection process. 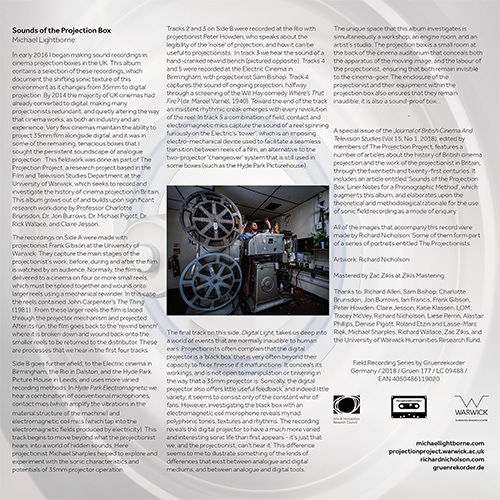 When presented at a large size, the inner sleeve image of a representative booth environment, filled as it is with spools of film and movie adverts, also allows the viewer to better appreciate the rather hermetic world inhabited by the projectionist. What a great record. And thank God it’s vinyl, because this is the only way to hear Sounds of the Projection Box, which is at once an homage to antiquated technology, a requiem for days gone by and a reflection of supposed progress. We’ve gained something in the switch to the digital format ~ clarity, seamlessness, an ability to show a film without any humans being present. But we’ve lost something as well ~ a tactile nature, a feeling of community, the contract between projectionist and audience. Earlier this year, I was at a film that “broke.” The older attendees kept turning back, looking up and yelling, “fix the screen!” But there was no one there; they were screaming into a void. Michael Lightborne captures sounds that might soon become extinct, in the same manner as certain physical environments ~ rain forests, barrier reefs ~ might disappear as well. As aural habitats become extinct, so does a way of life. The charm of the moviegoing experience, perfectly captured in Cinema Paradiso, is now muted. 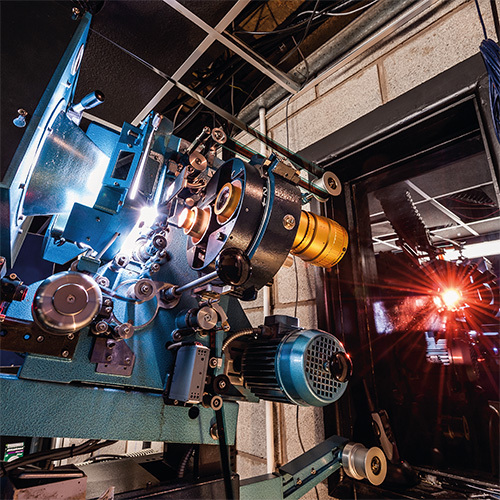 No longer can a child stumble up to a projectionist’s booth and see the magic in motion; no longer can a snippet of celluloid be given as a gift to a wide-eyed attendee. The art of switching between reels has all but disappeared. The spooling, the whirring, the flickering into life, all gone. In preparing this work, Lightborne traveled across the U.K., visiting the few remaining theaters that still use 35mm. The above photo portrays Peter Howden at the Rio, where two tracks were recorded. 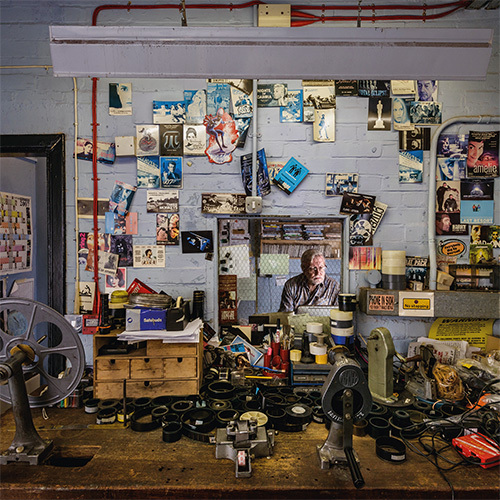 In his articulate, heartfelt essay, Lightborne calls the projection box “a workshop, an engine room and an artist’s studio.” The album is part of the larger Projection Project, which is sponsored by the Film and Television Studies Department of the University of Warwick. As the album unfolds, Lightborne tells a beautiful story in chapter order. First there are the audible sounds of the projectionist at work (screening Carpenter’s The Thing). At times, one can hear the foreboding music, a fine score brought to life. In the second track, one hears what sounds like duct tape ~ someone had to MacGyver the movie. The sounds are incredibly crisp, taking full advantage of the stereo field. Eventually they discover their own sort of rhythm. The next track features the amplification of contact and coil mics ~ sounds the projectionist might not otherwise hear. Then words about the craft, paired with the work, a segment that is particularly welcome as it highlights the human element. A transition piece introduces the Electric Cinema’s “tower,” a device that did away with the two-reel switchover system before it was itself surpassed by newer technology. The closing track showcases the sound of the modern digital box, which Lightborne notes “reveals myriad polyphonic tones, textures and rhythms.” The marvelous thing about Lightborne’s description is that he treats these sounds not as concession but as wonder; below the audible surface, there is still life. Reviewer’s note: A Richard Allen is thanked in the liner notes, but it’s not me. I’d love to think that it was me, and that the sound artist was thanking me in advance for a nice review. But it’s not! Shout-out to the other Richard Allen for representing our name so well. Great dollops of noise create tense, anxious track with Michael Lightborne’s “Sounds of the Projection Box”. For this work, Michael Lightborne relies heavily upon the natural rhythms that the machine creates. Layer upon layer of sound comes into the fray with such majesty and grace. Even within these noises Michael Lightborne occasionally lets something more come in, the way that little melodies flicker about in mere moments. By letting these pieces gain a level of prominence within the album the whole of the work feels so visceral. “The Thing” introduces the album with disorienting screams across the sky. Weird tempos roll through on “Making Up The Thing”. With “Breaking Down The Thing” Michael Lightborne engages in a decomposition sort of technique, letting the piece explore tactile moments within the disassembly. Near silence opens “Lacing and Rolling Rear Window” before it bursts in a flourish of color towards the end. Easily the highlight of the album is the rolling drone and neon-hued bliss of “Hyde Park Electromagnetic”. Such intensity dominates the brutal creaks of “The Noise”. Ghostly auras rumble through the entirety of “Manual Rewind”. Various snippets of samples pierce “The Electric”. A tragic quality concludes the album with the spacious, sprawling and ambitious “Digital Light”. Heavily layered “Digital Light” presents an entire journey that embarks upon disorienting sonic details that loom ever larger. “Sounds of the Projection Box” shows off Michael Lightborne’s ability to craft an entire narrative with a single event. […] More mechanics of some kind can be found on the LP by Michael Lightborne. I don’t think I heard of him before and he describes himself thusly: „Michael Lightborne is an artist based in Birmingham and Cork. He works with video, sound and print, and has exhibited around the UK and internationally, in exhibitions and film festivals. His work engages with questions of landscape, popular culture, memory, and technology. He is currently exploring the viability of ‘psychetecture’, a concept used in the 1980s comic Mister X to describe the psychological effects of architecture and urban forms.“ In 2016 and 2017 he did recordings in a cinema projection box, documenting the changing from 35mm to digital projection. 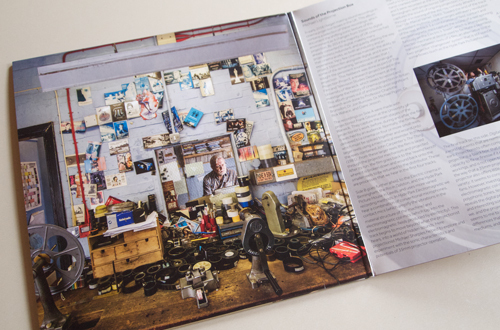 Very few cinemas still use 35mm, and Lightborne found one, which is what he calls „a workshop, an engine room, and an artist’s studio“, with a great picture on the cover. That one is on the first side of the record, while the other side contains a bunch of others. It ends with a digital projection recording. This is all very filmic, excuse the pun, of film flapping around and cans being opened, the motorizing of projectors and such like. It is indeed, one could say, the sound of an art slowly disappearing. It is very possible that our grandchildren will not be able to recognize any of these sounds. Lightborne records in-situ, and it is very much a documenting of the action. Getting the films on, starting the projectors and such. It is not like Büttner’s work a collage of various sounds together and presented as a composition, yet it is all most enjoyable to hear. Any sound that sounds great is a composition, perhaps (to avoid the more well-known ‚you don’t have to call it music if the term shocks you‘). Following the very lively first side, the second side gradually spirals down to the use of ‚modern‘ equipment and we hear how the world of projection changes. Ending with an electrical drone piece that is the world of digital projection. Another excellent journey, albeit of an entirely different nature. Great record!